NASA engineers reassembled the MA-1 Capsule to determine what caused the explosion shortly after the 1960 launch. In this historical photo from the U.S. space agency, the MA-1 capsule sits after reassembly. 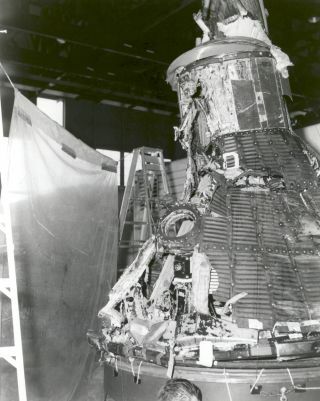 The main objectives of Mercury Atlas-1 (MA-1) were to recover the capsule and test the integrity of the Mercury capsule structure and afterbody shingles. About one minute after liftoff MA-1 exploded and the remaining debris landed 7 miles off the Florida shore. The debris was collected and engineers attempted to reassemble MA-1 to determine the cause of the explosion.